It was the aftermath of World War I (“the war to end all wars”) that restarted the production of silver dollars in the United States. During the war, in the hope of destabilizing British rule in India, the Germans had spread rumors that the British didn’t have enough silver to back their money. These rumors had led to silver hoarding, which lowered the ready supply of silver and drove up its price, threatening the British war effort. The British government asked the United States to start purchasing silver again in an effort to increase the silver supply and lower its price. The U.S. answer to this request was the Pittman Act of 1918, which authorized the United States to melt down up to 350 million old silver coins and sell them to the British for $1 per ounce of silver (plus the value of whatever copper was present in the mix). The Pittman Act then directed the U.S. Treasury to replace the melted coins by purchasing new silver AGAIN from American mining companies and using it to mint new silver dollars. According to government records, 270,232,722 Morgan Silver Dollars were melted down for sale to the British. That was fewer coins than the maximum allowed by the Pittman Act, but it still represents nearly fifty percent of all the Morgan Silver Dollars that had been minted up until that time. Congress held hearings late in 1920 and early in 1921 but took no action about a peace coin. Eventually advocates of the new peace coin decided that Congressional action was not necessary to create the new coin. The new Pittman Act had authorized the production of new silver dollars, and the existing Morgan Dollar design that was about to be reissued in 1921 could easily be replaced by a new “peace” design at the whim of the Treasury Secretary. As the date of a new and important disarmament conference approached in Washington, officials in the Harding Administration began to be more enthusiastic about the idea of a peace dollar. On November 19, 1921, James Earle Fraser, an important member of the U.S. Commission of Fine Arts (and the designer of the Buffalo nickel) sent personal letters to people who had been selected to submit possible designs for a new dollar coin. Among the recipients of Fraser’s letter were Victor Brenner, Adolph Weinman, Chester Beach, Anthony de Francisci, Henry Hering, John Flanagan, and Herman MacNeil. All submissions were due by December 12 (less than a month away). Each design had to include the mottos “In God We Trust” and “E Pluribus Unum,” the word “Liberty,” the words “United States of America,” and the denomination (one dollar). The head of Lady Liberty, rendered in a way that was “as beautiful and full of character as possible,” had to appear on the obverse side of the coin, and an eagle needed to appear on the reverse (as prescribed by the Coinage Act of 1792). Aside from those restrictions, the artists could design what they liked. There were two other entrants to the contest. 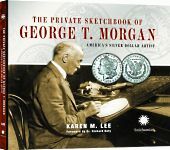 The current Chief Engraver at the U.S. Mint, George T. Morgan (the designer of the Morgan Silver Dollar), submitted a possible design at the request of Mint Director Raymond T. Baker. Also, an unsolicited sumbission was received from a Mr. Folio of New York City. 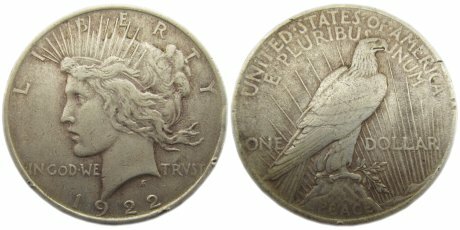 Filed under Coin History, Peace Dollar.